The Da Vinci Code promoted the idea that the superstition surrounding Friday the 13th dated to the Knights Templar, who protected Christian pilgrims during the Crusades. When he thought the Knights Templar had became too powerful, King Philip secretly ordered all of them killed on Friday, October 13, 1307. Many historians question the validity of this pat explanation, since the unluckiness of Friday the 13th wasn’t written about until 1907. All of this leads me to what shoes to recommend for today. Well, if you’d like to flaunt your love for Friday the 13th, especially the film, Mizzecustoms has you covered. They’ve designed a couple of gorgeously frightful Friday the 13th sneakers. 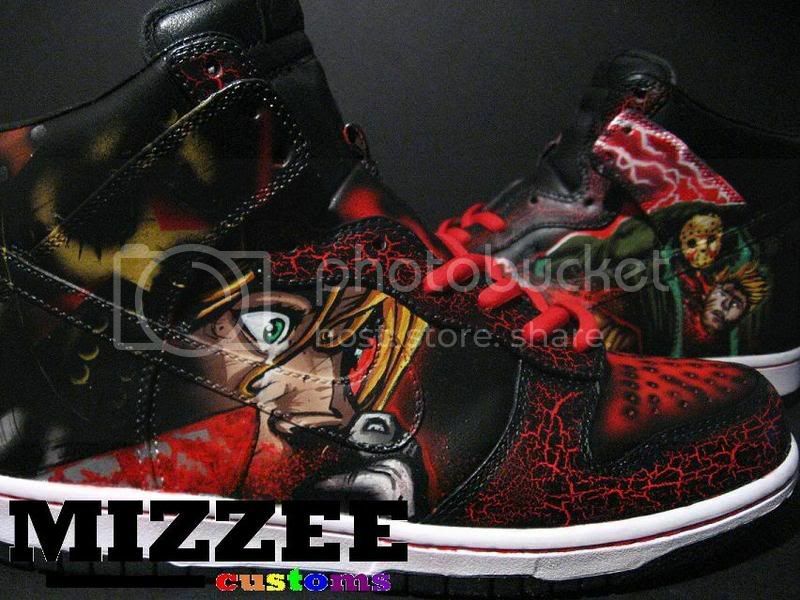 It’s amazing what a talented artist can paint on shoes. Personally, I like to pretend that superstitions have no bearing on actions– I make my destiny. Still, I sneak in a lucky charm now and then. Today, I’ll pair my lucky clover socks with irresistibly cute shoes. My thinking is that Friday the 13th unluckiness wouldn’t dare strike against a well-heeled fashionista. The Audrey by Joy Chen, shown above, channels one of the best-heeled fashionistas of all time: Audrey Hepburn. No unluckiness could possibly come to one wearing shoes with both buttons and bows, right? This entry was posted on Friday, February 13th, 2009 at 8:17 am	and is filed under Celebrities, Joy Chen, Main, shoes for work. You can follow any responses to this entry through the RSS 2.0 feed. You can leave a response, or trackback from your own site.